I don't think there is one person in the world that does not know who David Beckham is. His passion for soccer/football came at a very early age considering the fact that he was born in East London and would travel with his parents to watch Manchester United games frequently as profile of David Beckham shows. This is where his dream of playing professional soccer started and years later the little boy from East London would become one of the most famous footballers/soccer players in the world. David Beckams profile research I have done prior to writing this article shows that his passion for soccer started with a youth team Ridgeway Rovers, coached by his father and Steve Kirby. After few short trials with Tottenham Hotspur and Layton Orient, Beckham would come back to his favorite team growing up Manchester United Youth squad in 1991 where he would very quickly make his way into the first team squad. After one year with the youth team, young David Beckham won the FA Youth Cup with the team and had been given his chance as a first team player shortly after according to David Beckham life story. David Beckham signed his first professional contract with Manchester United in 1992 after displaying promise as a youth player and winning the FA Youth Cup during his first year with Manchester United. His first professional appearance came during the League Cup game against Brighton and Hove Albion as David Beckham profile states. At 19 years old, Beckham was still trying to find his place on the team. Not making the first squad led to a change in profile of David Beckham as he was loaned to Preston North End where after one year of playing experience, young David came back to Manchester United. At the end of the 1994/95 season, Manchester United would go through some changes due to many players retiring and leaving the team. Instead of bringing in new expensive additions, Coach Sir Alex Ferguson decided to form his squad from the young players that were just waiting for the opportunity to shine. David Beckham biography shows him as being one of the young players that took this chance with both hands and feet securing his first team position and performing better and better season after season which led to a big change in David Beckham life story in the years to come. 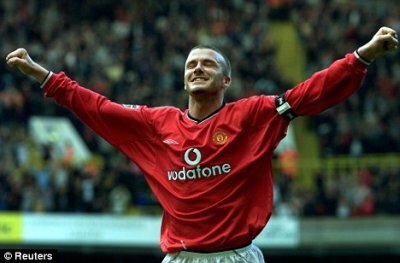 After displaying great form at Manchester United and playing better and better season after season, Beckham would reach the Englands squad for the 1998 World Cup adding one more accomplishment to profile of David Beckham. However, Beckham was criticized by England fans after this World Cup due to his loss of control in the game against Argentina during the Round of 16. David Beckham biography was tainted when he was sent off with a red card due to loss of control after the Argentine Simeone went in with a hard tackle to which Beckham responded by kicking the Argentine in the calf. Only one year later David Beckham came back into the headlines, but this time as a hero and a great footballer that helped Manchester United win the Triple title (League Title, Cup and Champions League) during 1999. Beckam was already one of the most famous soccer players/footballers and after 9 years with Manchester United he made a shocking transfer to Real Madrid. David Beckham bio continues in Real Madrid during 2003 transfer window. Signing a 4 year contract Beckham would not have the same great form he did at Manchester but would still win the league title in his last year with the club adding another accomplishment to his already rich profile. Being in a team that that was stacked with superstars such as Raul, Zidane, Ronaldo, Roberto Carlos etc, Beckham was publicized a lot more which brought his status up as a most famous and highest paid soccer player in the world. After 4 years with Real Madrid and not being guaranteed the first team spot, Beckham took the opportunity to join the American side LA Galaxy on a contract worth $250 million over the next 5 years. Profile of David Beckham suddenly became 250 million dollars richer and also set the new record transfer fee. During his time at LA Galaxy, Beckham was loaned to AC Milan in both 2009 and 2010 off season to keep his fitness lever up. David Beckham is married to Victoria Adams, famously known as "Posh Spice" of the pop music group Spice Girls, one of the world's top pop groups at the time. This only added to Beckhams public status and the couple would be dubbed "Posh and Becks" in the newspapers around the world.